The Mane Objective: February is Black History Month: Natural Hair BLACKOUT Challenge! February is Black History Month: Natural Hair BLACKOUT Challenge! The Natural Hair BLACKOUT Challenge! The core of the Natural Hair BLACKOUT Challenge is this: to purchase and use only products from Black-owned businesses on my hair during the month of February. I'm talking Be Kekoa. tgin. The Mane Choice. CURLS. Mielle Organics. Soultanicals. Kyra's Shea Medleys. Eden BodyWorks. Up North Naturals. Obia Natural Hair Care. Hydratherma Naturals. If there's a product in my regimen that's holy grail status but not Black owned, my challenge is to find a replacement. The point of the Natural Hair BLACKOUT Challenge is not to "limit" myself, but rather to make a conscious decision to financially invest in, and support Black owned businesses in an arena that I am most vocal - natural hair. It also serves as a way to remember who supported who first. When I say that, I mean, recognizing that the L'Oreals, the Garniers, the Pantenes, and the relaxer companies with our faces on the box were terribly unbothered by our natural hair until they realized how profitable the natural hair industry was. I speak with my platforms (blog & social media), but I also speak with my wallet. I'm encouraging you all to the same, and stand along with me this February. 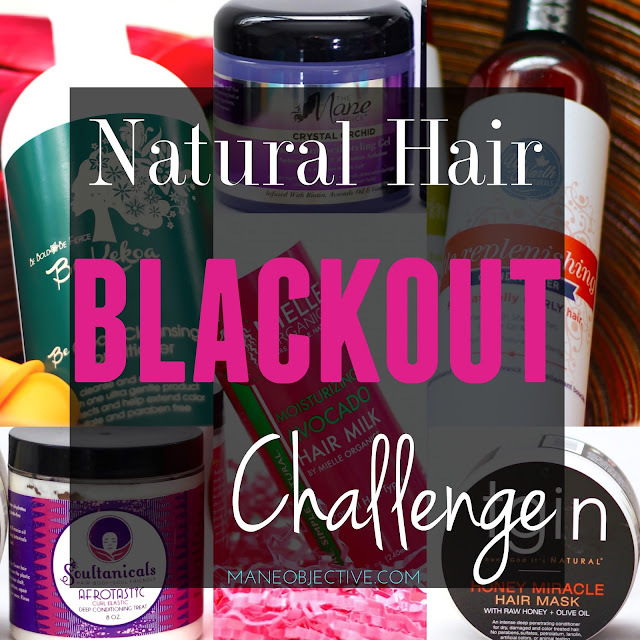 Take the Natural Hair BLACKOUT Challenge in your own way. If you can't afford to completely overhaul your regimen, then commit to purchasing at least one product from a Black owned natural hair business. Take advantage of at least one sale (I'll be sure to share them all on FACEBOOK, so be sure to like my page!) And if you really are about that life, go ALL IN with me! Chat with me in the comments below -- share some of your favorite Black owned natural hair brands, and let me know if you're joining me this February for the Natural Hair BLACKOUT Challenge! I'm joining you! Because of you I ONLY use Black owned products on my hair; Eden BodyWorks, True By Made Beautiful, Camille Rose Naturals, and Shea Moisture...though I'm not sure if By Made Beautiful is Black owned. The ONLY two products I possess that aren't Black owned is my VO5 Kiwi Clarifying Shampoo & my 32oz Lottabody Setting lotion (the old formula) mainly because I like to keep a sulfate shampoo on hand as a just in case & I've had that same bottle of setting lotion since 2011. O_o But I will definitely not be using those & will instead be using all of my other Black owned products. Love this! I'm proud to say that all of the hair products in my current hair regimen are from Black owned businesses. Mielle Organics and Tangles & Beyond are go-to products. Yes, yes, YES! I've been really wanting to try Tangles & Beyond -- but I can't be keeping up with drop dates. Lol. How do you like her products? I am all over this. I have ONLY used Black Owned products since before I went natural in 2013. Honey's Handmade, Shea Moisture, Brown Butter Beauty, and HoneyChile Hair Love are my staples. I was sad to drop Carol's daughter in 2012, but once Lisa sold out, the products no longer reflected the care she put into them. I am not sure who owns Eco, so I have been experimenting with other gels to replace it. My motto is, "If you don't have my struggle, you can't have my money". This does my heart good. I've only ever used black owned products on my hair since 2009. I also only use black owned products on my skin, too. Karen's Body Beautiful is a staple of mine. I also use Zuresh Full Body Cleanser for my skin.